Looking for the best deals on lawn care services in Des Moines, Iowa? Lawn Love is your answer. We're bringing lawn care into the modern century making it easier than ever before to get a lawn care service quote for services near you. Get an instant quote for lawn care services near you such as lawn aeration, lawn mowing, leaf removal, gutter cleaning, gardening, yard care, weed control and more. 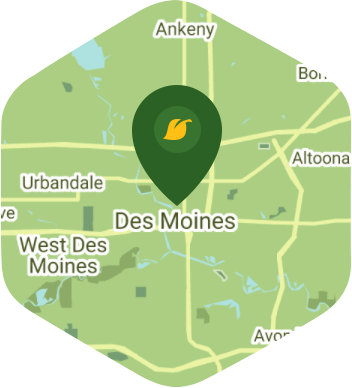 We're rated #1 in lawn care services in Des Moines, Iowa for a reason. The gleaming gold dome of the Iowa State Capitol building is just one of the things that people think of when they think of Des Moines. With its incredible botanical gardens, living history farms, and zoo, it's a bustling metropolis in the middle of the heartland. Of course, to you, Des Moines is simply the place you live, work, and raise your family. You may think you can't ask for more – except for more time! More time to do the things you enjoy with the people in your life who mean something to you. Well, with the help of Lawn Love, you may just be able to find that time. Lawn Love is a fully insured and bonded lawn care company. Our teams of highly skilled and experienced lawn care technicians want to work with you to create and maintain a lawn you can be proud to call home. We can take care of all the weeding, seeding, mowing, trimming, and clean up – all you have to do is give us a call to get started. To find out more about Lawn Love and take advantage of our free, fast and easy two-minute quote, call us today at 515-305-3166 and take the first step toward reclaiming more time in your life! It looks like the expected precipitation in Des Moines is 0.09 inches, which means you will probably have to water your lawn today. Dusk and dawn are the best times to water your lawn (the sun will rise at 6:21 AM and set at 8:04 PM today in Des Moines). Here are some average lawn care prices for homes in Des Moines. Average lawn size 5,354 sq. ft.